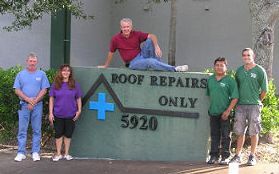 Meet our staff, pictured at our location in Indian River County. From left to right: David, Beckie, Jim, Fidel and Chris. Although each one pictured is not afraid to get their hands dirty, our field personnel totals 4 to 10 additional employees. 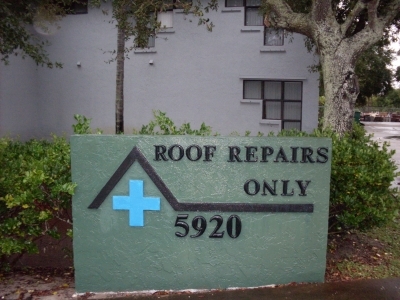 This building was designed by local Architect Tony Donadio and Roof Repairs Only owner Jim Parks, who developed the property and constructed the building pictured in 1992. This building incorporates our offices and warehouse space. In 1999 we built a 2,500 square foot building (not pictured) to incorporate vehicle parking and material storage. In total, our square footage is now 5,000 square feet. At this location we keep our customer records for a minimum of 10 years. We have many customer files that exceed 10 years, with particular attention to those properties which have changed ownership. Our job records include all phone messages, with relative documentation for instituting, generating, and completing roof repair contract proposals, customer and vendor correspondence. Our field employees are strictly monitored to include a daily log of their time and activities, morning and evening. The log includes pictures and written documentation of the work done, material used, times they leave the office, job, and any stop they make going to each job, or returning to the office. Copyright 2009-2012. All Rights Reserved.